In order to play Table Tennis, it’s important to have a reliable table that won’t wear out over time. The tables can be quite expensive so we want to make sure you’re getting your money’s worth. We will be going over the top 5 things that everyone should look for in a table. The recommended thickness of the table is 1 inch, but something along the lines of 0.75 inch would work as well. If you are playing on your leisure time, go for the 0.75 inch and don’t break the bank for that extra 0.25 inch! 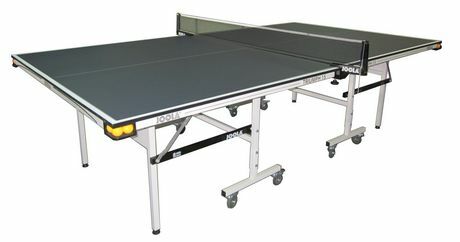 If you’re practicing to become a professional Table Tennis player then it might be better to purchase the 1 inch table. Every professional tournament uses a 1 inch table so it’s good to get a feel of the table before the actual event! The tables are quite large and can take up a lot of space so getting a table thats able to fold into a smaller table would be very convenient. If you wanted to bring your table over to a friends, portability would be a great feature. Features like these are important to consider when making a big purchase. Always make sure to look at the legs of the table as many people tend to overlook this feature of the table. Try to get a table with very strong legs that won’t budge when you slightly move it. Some tables have features that allow you to level out the table and this added bonus could make the table a little more pricey but think about what you want and understand the trade off before purchasing. Tables are prone to warping over time so look for a table top that’s made with strong materials to reduce the damage as time goes by. Try testing out the table top to see if its flat by using something straight and pressing it onto the side and top of the table. As long as the table is levelled and strong, you can play Table Tennis with no problem. The last thing to look for is a proper net that lays in the middle of the table top. Some nets with attachments have scratched the table and this is not what you want or it will harm the finish of your table. If you have this problem, try using some fabric to prevent that from happening! Try to look for tables that can re-attach the nets as this can be a good feature to have when you’re trying to switch out the net for a new one. Now that we’re all familiar with how to choose the perfect table, lets inspect a couple tables to see which best suites you! This Joola Midsize Table is meant for small spaces and so, they compromised durability for convenience. It’s also foldable so that adds to the convenience factor by allowing it to be portable and easily stored. There are tabs on the bottom of every leg to keep the table steady but it isn’t the most effective. 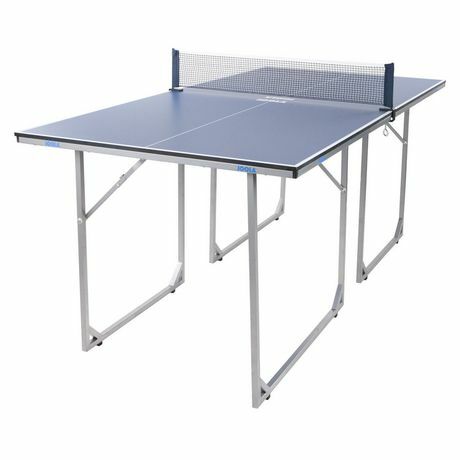 This is great for those who are on the market for a more affordable table to just play Table Tennis as a hobby. 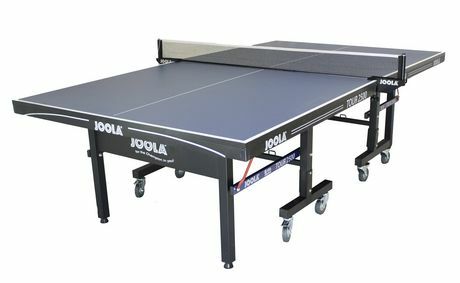 The Joola 5/8″ Table is not as thick as the regulation tables but it will still be functional and sturdy. The table is covered with a multilayer paint that prevents warping and allows for long term use. The frame of the table creates a very sturdy frame that will last a lifetime. It also includes foldable legs, adjustable height levellers, and an anti tilting device for safe mobility. The price point is still affordable but a little more than the other one as it has many added features. The final table we will be looking at is the Joola 1″ Table that is on the pricier side. This table fits all the requirements of a regulation table as it is 1″ in width, 50m frame, and 50 x 50 mm undercarriage. This table is very heavy duty as it weighs around 235 lbs. It is so heavy because of its sturdy legs and table top. It can be easily folded up and stored away. It also includes adjustable height levellers and four heavy duty 3-inch lockable casters for security purposes. In the end, its up to you to understand what best suites your lifestyle and interest for Table Tennis. We hope this helped you in making a decision on which table to buy and look forward to educating you in all things Table Tennis! Previous Previous post: Celebrate Labour Day in Toronto The Right Way! Next Next post: Places to Play Table Tennis in the GTA!